Does my bum look small in this? Ever wondered why you look great in some shops’ changing rooms, but awful in another? They may be using tricks to make you look thinner, or to make your skin look brighter. I took to the high street to find out which shops were guilty of ‘flattering’ their customers into purchases they might later regret. Very intriguingly, one mirror salesman told me about a prototype ‘skinny mirror’ that was displayed at a trade show. Have you come across it? Get in touch, if so – I’d love to track it down. Full text is also on the Sunday Times website here, and after the fold. Mirror, mirror on the changing room wall … does this make my bum look small? Women have started to challenge high-street fashion shops that appear to have mirrors that make them look a dress size smaller or a stone lighter. While some women are turning to websites such as Mumsnet to question the use of “magic mirrors”, others are heading for shops such as H&M, Gap and New Look because they prefer the image they see in the changing room. Carmen Carter, 34, a bank worker, who has previously posted comments about H&M in Sheffield, said this weekend: “I know most shops use flattering lights and slightly slimming mirrors, but H&M really takes the mick. I looked great no matter what I was trying on, and that’s because I looked a lot thinner in their magic mirrors. Another Mumsnet user, Pauline from Ringwood, Hampshire, who posts comments as “ggirl”, said she had asked about the mirrors at stores in Bournemouth. She said: “ The sales assistant at H&M said they were skinny mirrors and showed me the normal mirror. The main mirror outside the changing rooms was a normal one. “Gap at the same shopping centre has skinny mirrors, too, which I have mentioned to the sales assistant but she made no comment.” She bought a jumper in Gap because “it looked so fab” but “I looked so lumpy in it at home”. 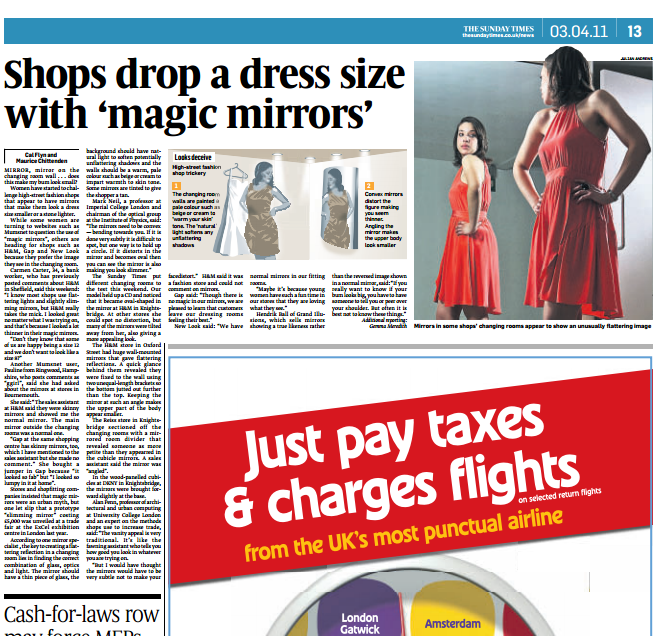 Stores and shopfitting companies insisted that magic mirrors were an urban myth, but one let slip that a prototype “slimming mirror” costing £5,000 was unveiled at a trade fair at the ExCel exhibition centre in London last year. According to one mirror specialist , the key to creating a flattering reflection in a changing room lies in finding the correct combination of glass, optics and light. The mirror should have a thin piece of glass, the background should have natural light to soften potentially unflattering shadows and the walls should be a warm, pale colour such as beige or cream to impart warmth to skin tone. Some mirrors are tinted to give the shopper a tan. The Sunday Times put different changing rooms to the test this weekend. Our model held up a CD and noticed that it became oval-shaped in the mirror at H&M in Knightsbridge. At other stores she could spot no distortion, but many of the mirrors were tilted away from her, also giving a more appealing look. The H&M store in Oxford Street had huge wall-mounted mirrors that gave flattering reflections. A quick glance behind them revealed they were fixed to the wall using two unequal-length brackets so the bottom jutted out further than the top. Keeping the mirror at such an angle makes the upper part of the body appear smaller. The Reiss store in Knightsbridge sectioned off the changing rooms with a mirrored room divider that revealed someone as more petite than they appearred in the cubicle mirrors. A sales assistant said the mirror was “angled”. In the wood-panelled cubicles at DKNY in Knightsbridge, the mirrors were brought forward slightly at the base. Alan Penn, professor of architectural and urban computing at University College London and an expert on the methods shops use to increase trade, said: “The vanity appeal is very traditional. It’s like the fawning assistant who tells you how good you look in whatever you are trying on. “But I would have thought the mirrors would have to be very subtle not to make your face distort.” H&M said it was a fashion store and could not comment on mirrors. New Look said: “We have normal mirrors in our fitting rooms.